SKI. STAY. PLAY. APRES. Giveaway! The friendly mountain town of Carbondale offers an intimate and authentic community vibe with affordable lodging, farm-to-table dining experiences, cultural events and easy access to two world class ski resorts. Carbondale, located 170 miles west of Denver and 30 miles from Aspen, is the perfect base camp for your winter adventures. 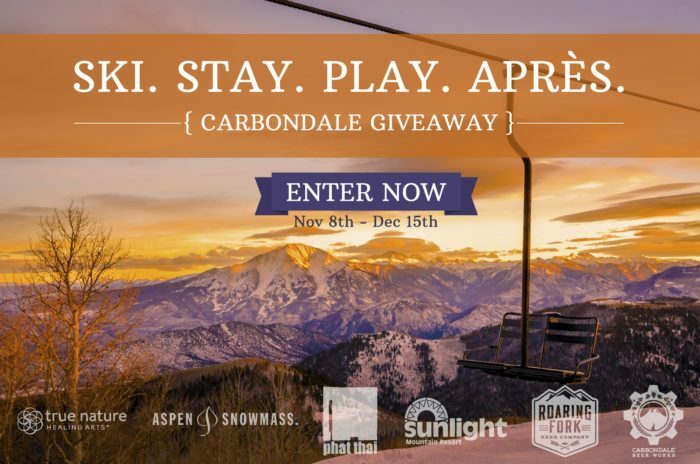 The Tourism Council of Carbondale, CO wants to help you start off the winter season by sponsoring the ultimate ski vacation getaway. Enter by December 15, 2017 for a chance to win! Must be 21+ years old to enter. A winner will be chosen on December 16, 2017. The winner will have until the end of the 2017/2018 Ski Season to book their package. *Blackout dates for lodging may apply. Read the Official Giveaway Rules.